KNCV has supported the national implementation of GxAlert in Botswana. GxAlert connects the GeneXpert diagnostic device to the internet and allows for automated feedback of laboratory results to patients, referring clinicians, treatment centers, Ministry Of Health staff and the country’s existing health information systems. With GxAlert in place, a patient with tuberculosis starts adequate treatment earlier, thus reducing the duration that a patient is infectious and therefore reducing the risk of infecting others. In addition, GeneXpert devices can be managed and monitored remotely to improve their effectiveness. The GxAlert initiative is a system for data management, designed to work with any TB, HIV, Ebola, or malaria diagnostic device that is capable of connecting to the Internet. A major benefit of GxAlert is that the system has the capacity to be integrated with devices from Cepheid, Alere, Abbott, Humastar, Sysmex, Fio and others. 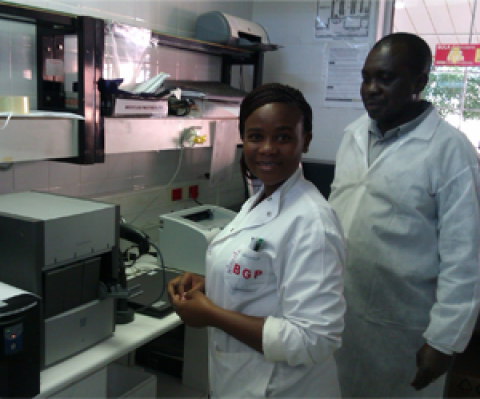 In 2015, under Year 1 of the Challenge TB project, a GxAlert consultant was engaged to conduct a landscape analysis which included proper evaluation of the TB information system policy, software readiness, and what infrastructure was in place. Botswana has many different Health Information System (HIS) tools: some are in proposal, others in deployment, and others in everyday use. Almost all of these systems are already networked and web-enabled, which significantly reduces the cost and effort required to integrate the systems. However, there is significant overlap in the HIS tools around tracking patient care. Different data management tools (IPMS, PIMS2, eTR, OpenMRS) all collect very similar information, often about the same patient. Some of the software tools are disease-specific while others are more general. Some are in use at the district level and above; others are for specific facility use. By connecting patient results directly into these different systems, it can reduce duplicate entry and errors in reporting while these systems are being consolidated. The Government Data Network (GDN) is rolling out Internet connectivity to the whole governmental infrastructure. Current estimates are that approximately one-third of facilities are already running the GDN. All stakeholders have been open, interested, and (so far) supportive to the initiative. Strengthening the interface with HIV programs. Based on the above landscape analysis, KNCV will continue to support the National Implementation of GxAlert in Botswana in the years to come. This type of program will be available for all Challenge TB countries who are interested.